Japan’s robust payments technology belies its largely cash-based economy. Boston, July 30, 2015 – Japan has had mobile payments since 2004—thousands of contactless point-of-sale terminals blanket its transit systems, and terminals grace nearly 50,000 retail locations across the country. 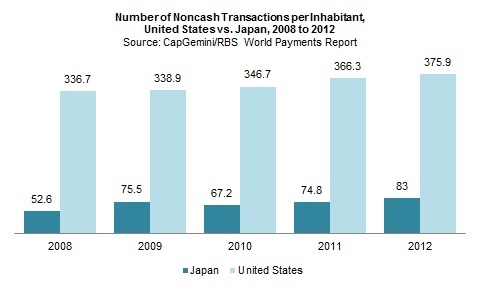 One could assume that Japan is one of the most advanced payments nations on the planet, but that’s not the case. Japan is a payments paradox, with sophisticated payments technology installed in one of the most cash-intensive societies in the world. How could this happen? And how and why is Japan different from the U.S. payment space? Based on Aite Group interviews of and discussions with more than 50 bankers, consultants, and retailers in Japan, this research explores the Japanese payments infrastructure and compares it with the U.S. payment system and global payment initiatives. It also describes the challenges that Japan faces in integrating its sophisticated, yet isolated, payment system with the rest of the world. This 19-page Impact Note contains 11 figures and two tables. Clients of Aite Group’s Retail Banking & Payments service can download this report.